Clapham North Art Centre is on Voltaire Road, just off the northern end of Clapham High Street. Clapham High Street (A3) links Clapham Common South Side and Clapham Road. The closest tube station is Clapham North (4mins). There are five buses that stop on Clapham High Street and one that stops on Bedford Road. There is paid street parking available and up to 2 hours paid parking at the big Sainsbury's up by Clapham Common (8mins). Clapham High Street train station is very close by (1min). Clapham North Art Centre is roughly at the midpoint of Voltaire Road, where it takes a 90 degree turn. As you walk through the main gates you will see a short flight of steps to your left (below the big blue sign for Clapham North Art Centre), go up these steps, turn right and Unit 7 is straight ahead. Do not go to the small red sign saying Block 7, this means you've gone too far into the centre - you'll need to back up and take the first flight of stairs on the left. Clapham North tube station is on the Northern Line and is 4 minutes walk away. As you exit the station, turn left down Clapham High Street. After 100 yards you will reach a pedestrian crossing with lights, take this to cross over the road so that you can go down Voltaire Road (on your right). As Voltaire Road turns left you will see Clapham North Art Centre in front of you. These buses: 50, 88, 155, 322, 345 all stop on Clapham High Street (A3) and the P5 stops outside Clapham North tube station on Bedford Road (B221). As you walk north down Clapham High Street (away from Clapham Common), Voltaire Road is on your left just before the railway bridge. As you walk down Voltaire Road you will see Clapham North Art Centre in front of you. Clapham High Street train station has direct trains to and from Victoria and London Bridge. As you exit the station, turn right down Voltaire Road and you will see Clapham North Art Centre in front of you. If you are driving north on Clapham High Street (A3) away from Clapham Common, Voltaire road is the last turning on the left before the railway bridge. Turn left down Voltaire Road and find somewhere to park. If you are driving from Clapham Road (A3) towards Clapham Common, you cannot turn right down Voltaire Road. Take the second turning on the right after the railway bridge, this is Edgeley Road. On Edgeley Road take the first turning on the right into Voltaire Road and find somewhere to park. If you want to park in the big Sainsbury's, drive down Clapham High Street towards Clapham Common. Just before you get to the Common, turn left down Clapham Park Road (A2217). Then take the first left into Sainsbury's car park. 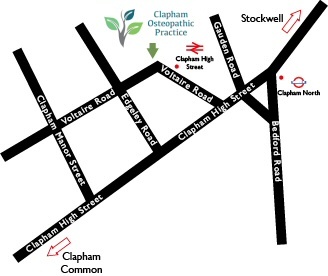 To find us, walk through the store onto Street, turn right and walk down Clapham High Street (away from the Common). At the end of Clapham High Street there is a railway bridge, take the road on the left just before it, this is Voltaire Road. As you walk down Voltaire Road you will see Clapham North Art Centre in front of you. This walk takes about 8 minutes.